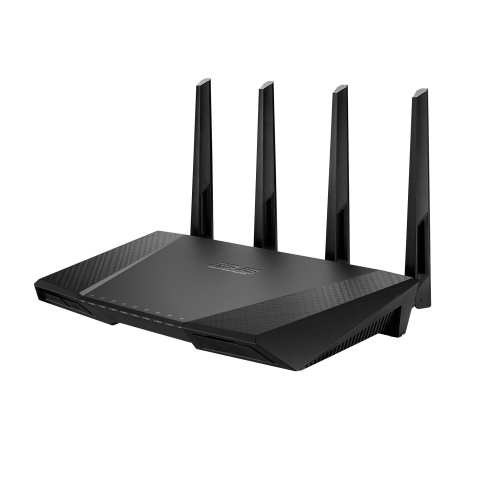 FREMONT, Calif.--(BUSINESS WIRE)--Following its preview at CES 2014, ASUS is excited to launch the ASUS RT-AC87, the world’s first Wave 2 802.11ac consumer router and the fastest 5 GHz with speeds up to 1.73Gbps. Powered by Quantenna’s award-winning QSR1000 4x4 Multi-User Multiple Input Multiple Output (MU-MIMO) chipset, the ASUS RT-AC87 offers unparalleled speed and range for a superior wireless experience. The RT-AC87 utilizes four external antennas and Universal Beamforming to maximize range throughout the home or office, improving signal strength and performance even to older 802.11a/b/g/n clients. Capable of reaching speeds up to 1.73Gbps1, the RT-AC87 is ideal for HD-grade video, ultra-low-latency gaming and heavy file sharing. Its breakthrough MU-MIMO technology enables it to stream rich content to multiple devices in every corner of a home, in Full 1080p or 4K Ultra HD resolution. With MU-MIMO1, the RT-AC87 can form groups of multiple devices that can be served at the same time, simultaneously. Previous 802.11n and 802.11ac routers can stream to only one device at a time. MU-MIMO greatly increases the efficiency of the Wi-Fi network, mitigating potential bottlenecks as more devices are connected to the access point. Furthermore, the RT-AC87’s multiple antennas, coupled with its advanced beamforming, reduce the transmission’s signal-to-noise ratio and improve the reliability of the Wi-Fi signal, providing a better overall wireless experience. Quantenna is a global leader and innovator of ultra-high performance 802.11ac and 802.11n Wi-Fi semiconductor solutions that establish benchmarks for speed, range, efficiency and reliability. Quantenna pioneered the delivery of seamless multimedia video and data anywhere indoors and outdoors. Named “The Next Big Thing” by the Wall Street Journal, Quantenna has shipped millions of its Wi-Fi chipsets being deployed by major retail, telecom, cable and satellite service providers and operators worldwide including AT&T, DIRECTV, Bell Canada, Swisscom, Telefonica, France Telecom and Belgacom. Quantenna is headquartered in Silicon Valley, with offices worldwide. Quantenna and ASUS make world's first Wave 2 802.11ac router available to consumers.